"I love that this recipe uses the leftover veggies and meat from a party or picnic. It tastes great and is super easy to make." 3Mix carrots, onion, and butter together in a 9x13-inch baking dish. 4Bake carrot mixture in the preheated oven until slightly tender, about 10 minutes. 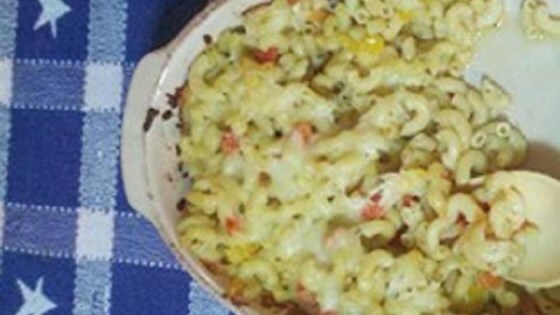 5Mix macaroni, chicken, 3/4 cup mozzarella cheese, Caesar dressing, sweet bell peppers, and Parmesan cheese into carrot mixture; top with remaining mozzarella cheese. 6Bake in the preheated oven until casserole is heated through and cheese is melted, about 25 minutes. Cooked sausage can also be used in place of the chicken.